The Jamaica Center Business Improvement District (JBID) in Queens, NY manages the largest business district in New York City in one of the most densely populated areas in the country. JBID’s executive director is an experienced civic and private industry leader, having worked in two separate White House administrations. She reached out to our team for help with crafting impactful annual reports and a thought leadership white paper focused on Digital Inclusion. Having studied, lived and worked in New York City for more than a decade, our team understood the cultural and business dynamics across the five boroughs of New York City, which we were able to leverage in the development of these materials. We worked closely with the executive director and her team to understand who the most important audiences were for the annual report and white paper. In addition, the Wall Street Journal and Gothamist each had just ranked Jamaica Queens as the hottest neighborhood in New York. 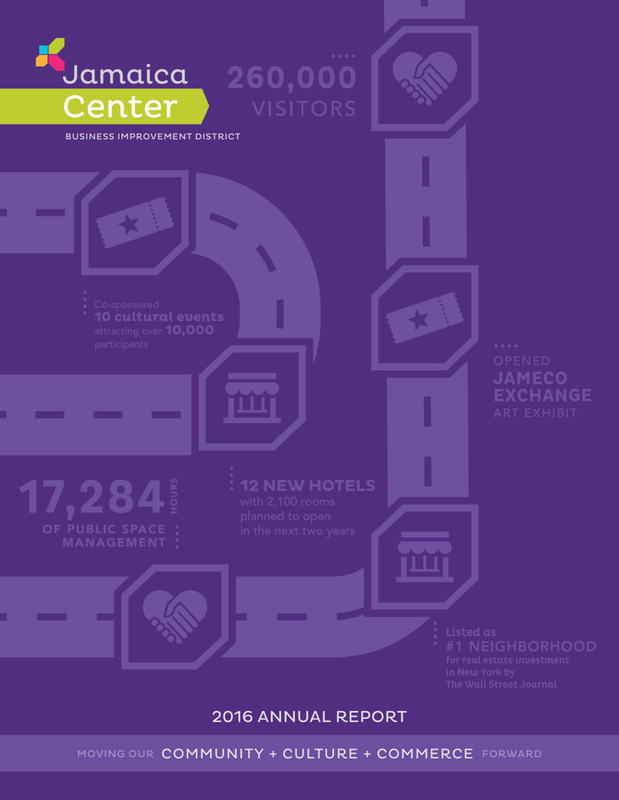 We put our journalist hats on and identified several compelling stories happening across Jamaica Center from the arts, fashion, business, education and restaurants to highlight the positive growth and investment happening in this part of the City. The annual reports were distributed to business partners, civic leaders, local organizations and members of the community. For the Digital Inclusion white paper, we worked closely with the Jamaica Center BID leadership team to understand how the Digital Divide was impacting the community locally and what ideas they were exploring to address the issue. We took a broad, complex national issue and helped our client localize it, articulate their vision for addressing the challenges and engaged key partners in the dialogue to activate solutions. We truly enjoyed partnering with the BID’s executive director and appreciate her feedback in this 5-star Google Review.